One of our biggest failures is the fallacy of self-sufficiency. When we are confident in our own strength, we tend to leave God out of the process. But God is a master at stripping us to the point where we are forced to call out to him. This isn’t capricious or selfish; it’s relational. He wants us to talk to him, to include him in our being. Consider the thieves on the cross. They were stripped of their property, their wealth, their families, their liberty, their dignity, their health, and their future. They literally had nothing left except the company of a man so badly beaten that he could not be recognized as one. He suffered under a sign: The King of the Jews. 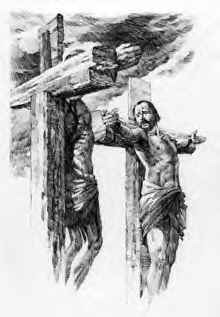 In any other circumstance, this man being crucified with them would have been mocked or ignored. He claimed to be the Messiah, but he was on a cross! At first they did revile him. But the words and attitude of that man witnessed to who he was. It must have seemed a slim hope for the thieves, so slim that it would have at any other time been passed over without thought. But the thieves were stripped. No matter how slight a chance that he was who he said, he was the only thing left. Still, one thief continued to mock him. It was not enough. But the second thief responded. “Lord, remember me when you come into your kingdom.” The thief acknowledged his sins and recognized the sinless character of the God Man. He called him Lord and accepted that he had the power of death and life and was heir to the kingdom of God. Jesus responded, “This day you will be with me in paradise.” Not just restored to, but with: a statement of relationship. The stripping became a blessing. His heartfelt cry for a relationship with His people is still felt today. May we have receptive hearts to the stripping when the hand of God moves against our self-sufficiency, so that we can experience it as a blessing and not a curse.